I know this one's going to irk some people. I got this Fender steel guitar from a guy in Alabama a few years ago. He told me that he got it from a lady who was a cast member of Hee Haw. 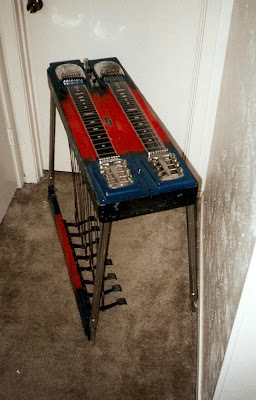 This steel guitar was used on the show. I guess her husband wanted to learn to play steel so she got it for him. As you can see, it was painted red and blue "sunburst". It looks like they just took a couple of cans of spray paint and did it themselves--hillbilly style! I hope there weren't any close ups 'cause it was a pretty poor, Earl Scheib-type paint job. Actually, it was more like a Johnny Bench, Krylon paint job. Here's the irk'er--I went ahead and stripped it down and had it painted a nice blonde color. Is that bad? Well, at least I still have the before pictures. Does anyone know who actually played this steel? I heard that it could've been Maurice Anderson or Curly Chalker.